Jayu-ro – “Freedom Road” – is an odd place, sometimes unnervingly so. For starters, it may be the world’s most geopolitically unconventional highway. Linking Seoul and Paju’s Imjinggak Pavilion, the gateway to North Korea, the road hugs the heavily fortified Hangang and Imjingang rivers, the mountains of the DPRK visible just across the water, except at night, when the land on the other side is so disquietingly dark it’s like staring over the edge of the world. The watchtowers and barbed wire remind travelers that this is the world’s most militarized border, a frontier former U.S. president Bill Clinton called “the scariest place on Earth.” That this is less than an hour’s bus ride from Seoul’s Hapjeong Station makes it all the more surreal. Despite the barbed wire, however, the stretch of country along Jayu-ro is one of great beauty and tranquility. The wetlands of the Hangang River estuary teem with life, the mudflats and fields of reed offering shelter and sustenance to fauna such as shellfish and migratory birds. The proximity of the DMZ, one of the world’s longest unintentional nature preserves, encourages an atmosphere of peace and relaxation, an atmosphere that encouraged the development in the region of two of the country’s best known artistic communities, Paju Book City and Heyri Art Valley. This is where you go on a weekend to relax over a good book or a hot cup of coffee, to let your worries fly away in the autumn wind. Hop on the double-decker Bus 2200 at Hapjeong Station. 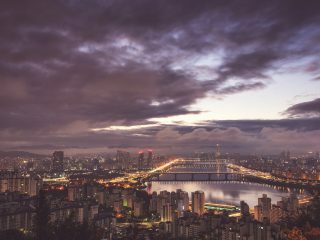 A 40-minute drive along the Hangang River later, you’ll come to a quiet wetland filled with buildings so chic and so unexpected as to seem out of place. Welcome to Paju Book City. Inspired by Hay-on-Wye, Wales’s “town of books,” Paju Book City is a complex dedicated to the creation of the written word. It’s currently home to over 50 cultural spaces, including publishing houses, workshops, book cafés, book stores, art shops, museums and galleries. To fans of visually appealing architecture and design, the “city” is like a box of chocolates, boasting work by many respected local and overseas architects, all wedged into a narrow strip of wetland between the Hangang River and a hillock overlooking the town. Indeed, as you stroll around the complex, it seems as if the resident companies competed with one another to build the prettier building. 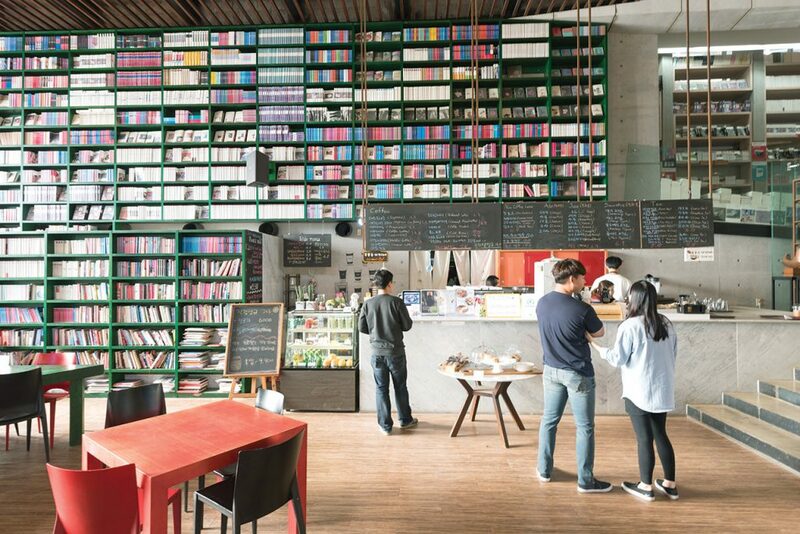 With its cafés, cultural centers and Instagrammable spaces, Paju Book City might be expected to draw huge crowds on the weekend. Fortunately, that is not the case. The town empties when the local publishers close for the weekend, leaving behind a place that can seem a bit like a ghost town. That’s alright, though – the book cafés and strolls along the reed creeks are best enjoyed in peace and quiet. 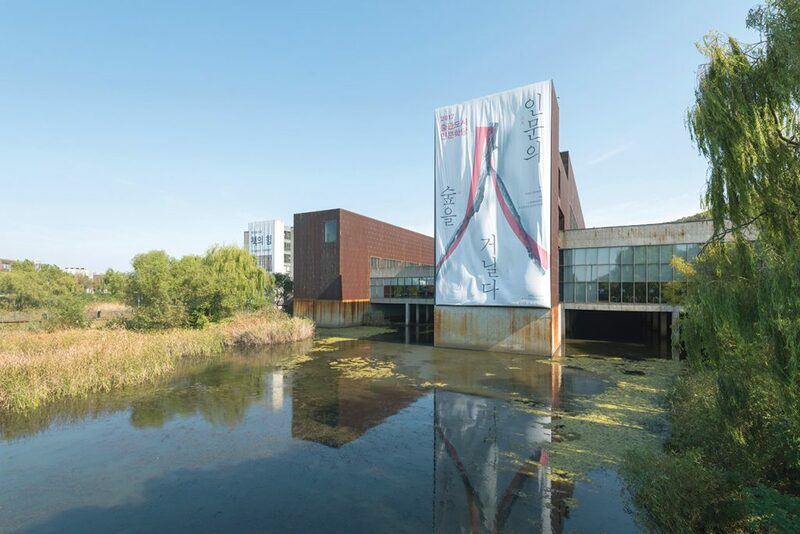 Paju Book City’s best recognized landmark is the Asia Publication Culture & Information Center, a massive, elegantly designed structure of steel plate, concrete and wood standing in the middle of a pond of reeds. 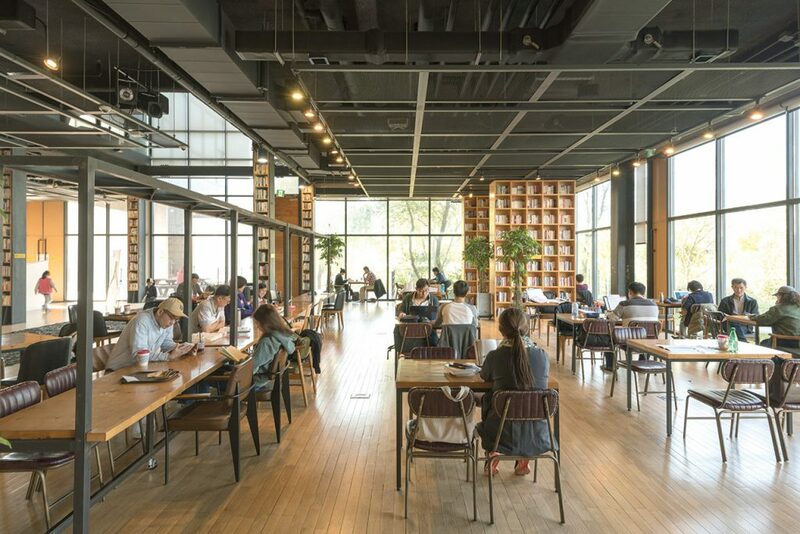 The multipurpose space, which hosts lectures, forums and educational programs, has conference rooms, bookshops, exhibit spaces, classrooms, cafés, restaurants and even a lovely guest house, the Jijihyang, where the rooms are unequipped with televisions. The Asia Publication Culture & Information Center’s true claim to fame, however, is its so-called “Forest of Wisdom,” a cavernous reading space lined by 20,000 titles stacked on shelves eight meters high. Grab a book, get a cup of coffee from the coffee shop and have a seat, preferably next to one of the windows that look onto the wetlands. Get there early, though – this is the one part of Paju Book City that does fill up on a weekend. Also worth visiting is the Mimesis Museum, a white concrete building with feline curves designed by renowned Portuguese architect Álvaro Siza Vieira. Hop again on Bus 2200 and ride another 20 minutes or so until you reach Hyeri Art Valley. 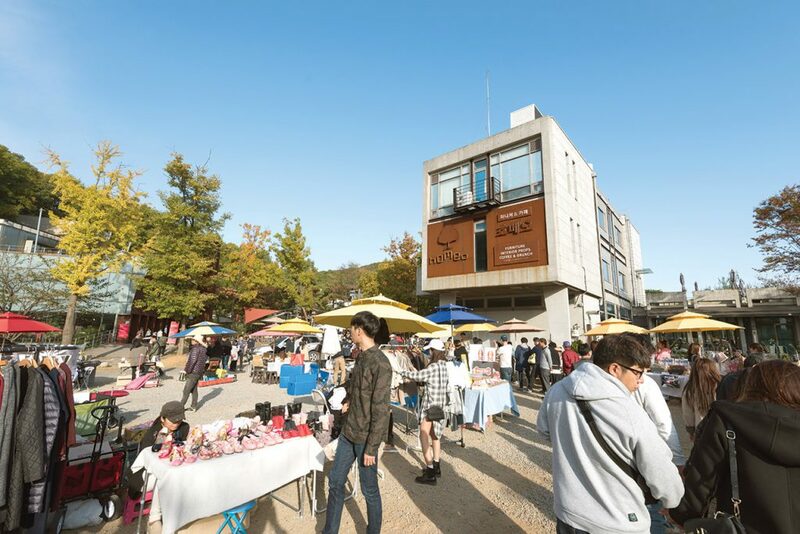 Founded in 1998, Hyeri Art Valley was intended as a creative community, a place where painters, sculptors, musicians, filmmakers and other artists could work in the peace and quiet of rural Paju. 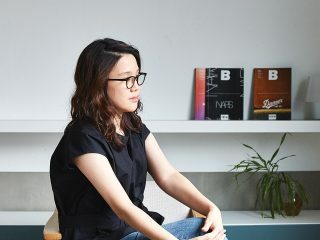 Like Paju Book City, the town was designed with aesthetics in mind, its workshops, galleries and performing venues commissioned to leading architects from Korea and abroad. To be sure, the architecture at Hyeri Art Valley is first rate. The Blume Museum Of Contemporary Art, easily recognized by its undulating concrete mass and the oak tree sticking out of its façade, is especially lovely. Book House Foresta, a café and museum space operated by Hangil Publishing, delights with its face of wooden planks and its high open spaces. Given the large numbers of Seoulites who descend on the place on a weekend, however, it’s hard to imagine much artistic creation happening between Friday night and Monday morning. On a weekend, the town takes on the appearance of a kapechon, or “café village,” a cluster of cafés that seemingly exists for the pleasure of urban day trippers. This doesn’t make it a bad place. Far from it – the cafés are delightful, and there are outdoor markets where you can purchase handicrafts, vintage clothing and other products. If you’re looking for a quiet artists’ commune, however, go on a weekday. From Hyeri Art Village, hop on Bus 900 and take it to the last stop, the Odusan Unification Observatory Rest Area. 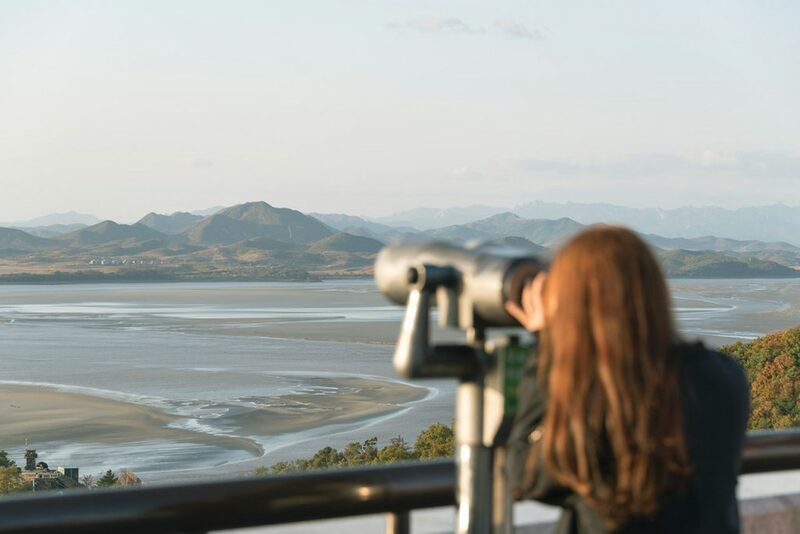 From there, you can hop on a free shuttle bus to Odusan Unification Observatory, a scenic hilltop overlooking the confluence of the Hangang and Imjingang Rivers. More to the point, it overlooks North Korea, offering direct, unobstructed views of what was, prior to 1945, the northern half of the country. Using the binoculars available at the observatory, you can get a closer look at the villages, fields and mountains on the other side of the river. 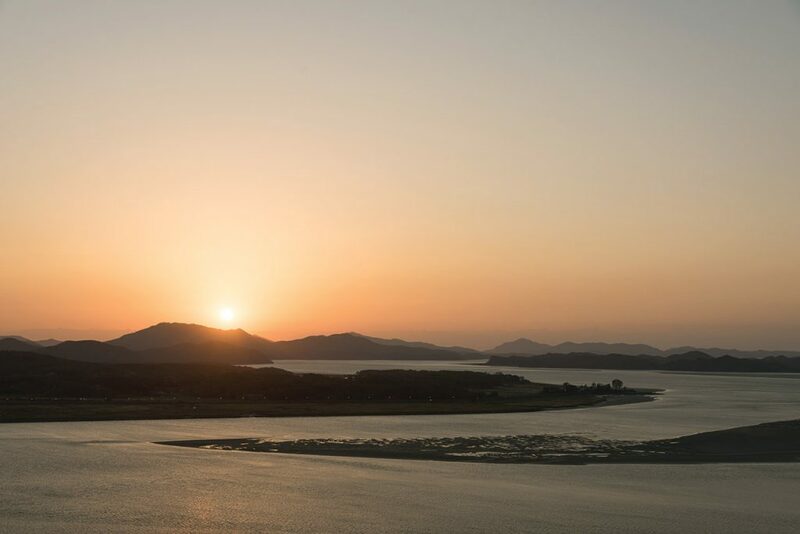 Likewise, you could just sit back and take in the beautiful scenery where two of Korea’s great rivers meet. The sunsets are especially inspiring. As elsewhere along the DMZ, you feel a profound sense of calm. Maybe this isn’t what you’d expect at the Cold War’s last remaining frontier, but there you have it. You get a similar feeling at Imjingak, the northern end of Jayu-ro. Built in 1972, this park on the Imjingang River stands on what was the old railway line that linked Seoul with Pyongyang and other northern cities. Two railway bridges -– one left in ruins after it was destroyed during the Korean War, the other rebuilt afterwards -– still cross the river. You, however, may not, except on special trains that take tourists to Dorasan Station, which overlooks the DMZ. For many Koreans, Imjingak was as close to North Korea as they could get. Koreans who hailed from what is now North Korea, unable to return to their hometowns, visit on holidays to offer group memorial rites at an altar erected in 1985. Using binoculars, you can even see the mountains of North Korea. Imjingak is also home to Pyeonghwa-Nuri Park, a beautiful landscape of green, windswept hills and pleasure ponds, punctuated by works of installation art, including a series of four giant, bamboo men seemingly walking up a hill, a work that serves as a prayer for peace and national reunification. The park also has a pleasant café overlooking a pond and the so-called “Hill of Wind,” an elevation covered with countless pinwheels. 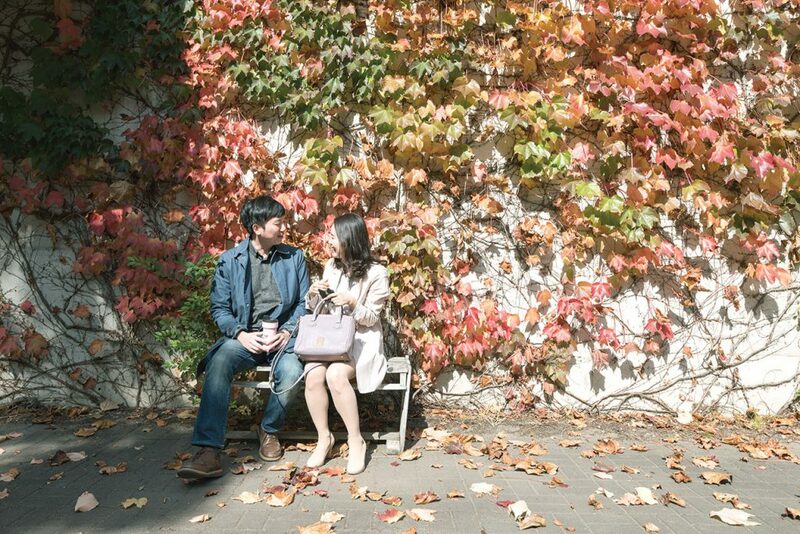 EAT> Between Paju Book City and Hyeri Art Valley, you’ll be tripping over cafés. For something more substantial, though, Paju – or at least the hamlet of Jangdan – is known for its high quality soybeans. You can find lots of places specializing in Jangdan bean cuisine, including cheonggukjang stew and soft bean curd, in the village of Seongdong, near Hyeri Art Valley. 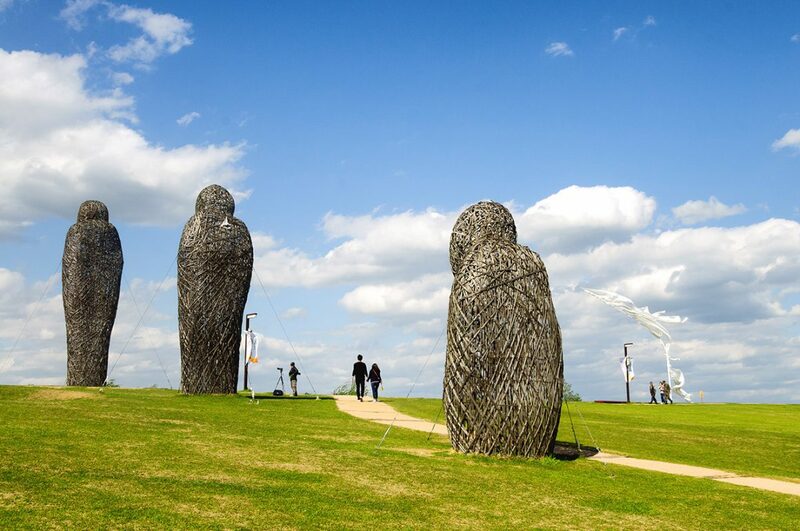 GO> Paju Book City and Hyeri Art Valley can be reached easily by Bus 2200 from Hapjeong Station (Line 6). To get to Imjingak from there, however, requires a longish taxi ride or some bus hopping. Of course, if you’d like to go directly to Imjingak from Seoul, just take the Gyeongui Line from Seoul Station to Imjingang Station.